Which Firefox and Thunderbird Extensions Should I Install? One reason the Firefox Web browser and Thunderbird email software applications are so popular is the facility for users to enhance and tailor their behavior to satisfy individual needs and preferences. But their many hundred add-ons can be a bit intimidating, leaving people wondering what areas to consider tweaking and which add-ons to install. For better or worse, it’s hard to get useful advice about this from others. Asking someone which add-ons to install is like asking in a large bookstore which books to buy, or requesting advice on buying a car without explaining how much money you’d like to spend and what sort of driving you do. I always suggest starting slowly. There’s no reason to rush and often several items perform similar functions, making research worthwhile. Finding and installing add-ons is almost identical for Firefox and Thunderbird; only the last few steps differ. For Firefox, these include Appearance, Bookmarks, Search Tools, Tabs, Toolbars, and more. Thunderbird’s categories include Contacts, Message Reading, News Reading, and Privacy and Security. Browse featured items and explore areas of interest, or search directly for one which was recommended to you. To explore an item, click its title to see a longer description, often including screen shots and snippets from user reviews. Most valuable information includes a one-to-five star rating and the number of downloads done. Obviously, the more stars rated and the more downloads reported, the more valuable and trustworthy an add-on is. I won’t install something not rated highly or which hasn’t been downloaded a LOT. And I’m wary of — though I’ll sometimes install — goodies which have been too recently uploaded or which haven’t been updated in a very long time. Also check which versions of Firefox/Thunderbird are supported. If you’ve just installed a new program version, some add-ons may not have been updated to support it. And if you’re too far behind the current version (though why would you be? ), some add-ons may not support older versions. After sniffing around, to install a Firefox item, click its Add to Firefox button and follow the simple instructions; the typically small bit of software will download and be plugged into Firefox; you’ll then be told that it will be available when you restart the browser. You may then see the add-on’s welcome Web page or an options panel for configuring it. Read instructions and zip through available options so you understand its basic capabilities. You can always return to the options by clicking Tools/Add-ons, the item name, then the Options button. Two other buttons — Disable and Remove — make it simple to temporarily or permanently delete add-ons, so experimenting is essentially risk free. Installing Thunderbird items is similar except that installation isn’t quite as automatic. 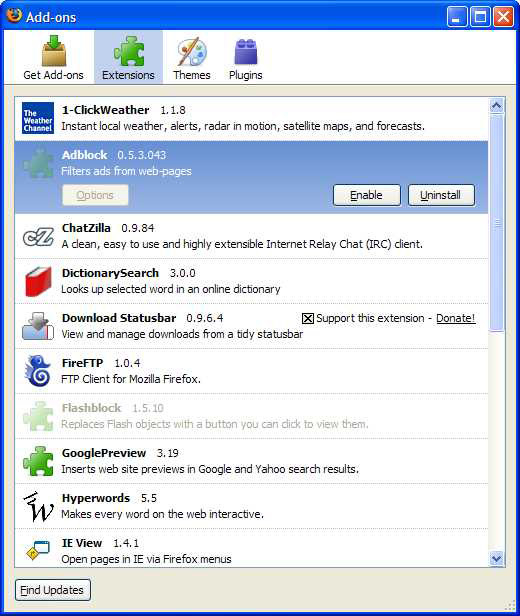 After downloading an add-on, use the Add-ons dialogue box to navigate to the downloaded file and install it. As with Firefox, add-ons take effect when you restart Thunderbird. I won’t presume to tell which add-ons to install, since discovering them is part of the fun. But I’ll recommend two of my favorites for each application: For Firefox, I like 1-ClickWeather and IE View; for Thunderbird, I like AttachmentExtractor and Xpunge. WOT & Noscript for safer surfing. Adblock Plus – unless you like looking at the ads. These are ‘my’ musts, although they’re only about 10% of my add ons. The rest just depends on what you want to do on the web. IE TAB – allows you to render sites using the IE engine (as some sites are really only IE compliant. Outwit Docs – a document harvester. Just started using it – but found many cool documents using it.